Your invoice indicates the date purchased and which warranty type coverage is associated with your purchase. Your receipt is the official indication of the warranty coverage associated with your battery purchase. Warranty types are NOT retroactive and cannot be converted. Installation labor is included in the warranty. We come to you and replace the battery after you have it diagnosed. Battery must be in the original vehicle that it was installed & cannot be removed/placed in a different vehicle. This voids the warranty. If you believe that you have a battery failure you must have the trouble codes read & provide us a copy. We do not pay for diagnostics, towing, or any other fee incident to a battery failure. The warranty is transferrable in accordance with our transfer program. The battery must stay in the original vehicle which it was installed. It cannot be removed and placed in a different vehicle. This voids the warranty. If you believe that you have a battery failure you must provide us the trouble codes. 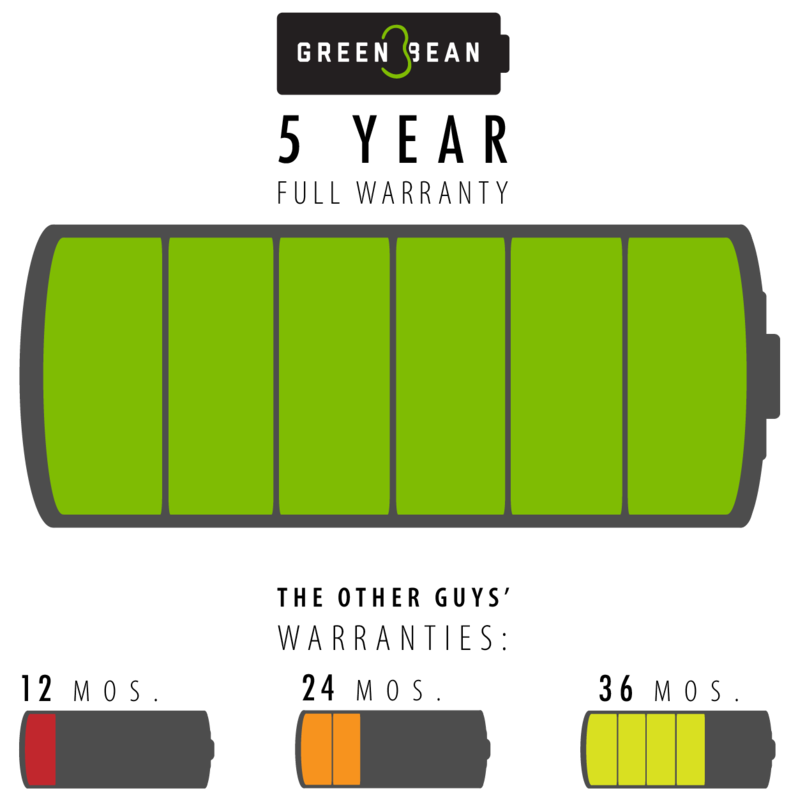 Relax, all Green Bean Batteries have a 5 year unlimited miles warranty. Although we want you to be 100% satisfied we must limit our liability. By installing our product you agree to our limited warranty and the limits of our liability and waiver of claims. All warranty service requests must be initiated by calling 919-446-3112. We will send you a warranty diagnostic worksheet to guide you through the process. Upon review of the repair shop/dealership diagnosis, and determination of a battery failure within the warranty period, Green Bean battery will replace the failed battery in accordance with the warranty. Green Bean Battery will not reimburse for diagnostic expenses or towing associated with any warranty claims. No warranty replacements will be processed without a diagnosis, and diagnostic trouble codes from a repair shop or dealership. No exceptions. 5 year warranty: This product warranty becomes null and void if the damage is caused by: misuse, abuse or accident; the attachment of any unauthorized accessory; alteration to the product; improper installation; exposure to harsh weather and/or chemicals; or lack of proper maintenance. This warranty also becomes null and void if the product is opened or any sticker is tampered with, broken, or missing, or if the damage is caused by any other condition that is beyond the control of Green Bean Battery Products. IN ALL CASES, GREEN BEAN BATTERY SHALL NOT BE RESPONSIBLE FOR ANY TYPE OF INCIDENTAL, CONSEQUENTIAL, OR SPECIAL DAMAGES. ALL OTHER WARRANTIES, INCLUDING THE IMPLIED WARRANTIES OF FITNESS FOR A PARTICULAR PURPOSE AND THE IMPLIED WARRANTY OF MERCHANTABILITY, ARE EXCLUDED. By accepting this product, you hereby waive and release any claim now or hereafter existing against Green Bean Battery, its employees, officers, directors, agents and customers, on account of any and all claims, demands, suits, causes of action and all legal proceedings, whether civil or criminal, damages, losses, liabilities (including, but not limited to, strict liability in tort), obligations, penalties, judgments or fines and other sanctions, and any costs and expenses in connection therewith, including legal fees and expenses of whatever kind and nature, which may result from or arise out of injury to or death or loss or damage to property or the loss of use of any property which may result from or arise out of the possession, condition, use or operation of this product. Warranty is transferable in accordance with our warranty transfer program. Warranty is NOT transferable to any other vehicle except where required by law. This means the warranty only applies to the purchased battery in the original vehicle. This warranty becomes null and void if you install the battery in a different vehicle other than the original vehicle. Warranty becomes null and void if the vehicle is totaled in an accident or otherwise written-off. If battery is found to be defective in material, workmanship, or installation by Green Bean Battery during the warranty period, Green Bean Battery will replace the hybrid battery free of charge once the vehicle has been diagnosed with a hybrid battery failure and we review the diagnostic information to confirm the failure. Any condition beyond the control of Green Bean Battery, Inc.
By accepting this product, you hereby waive and release any claim now or hereafter existing against Green Bean Battery, its employees, officers, directors, agents and customers, on account of any and all claims, demands, suits, causes of action and all legal proceedings, whether civil or criminal, damages, losses, liabilities (including, but not limited to, strict liability in tort), obligations, penalties, judgments or fines and other sanctions, and any costs and expenses in connection therewith, including legal fees and expenses of whatever kind and nature, which may result from or arise out of injury to or death or loss or damage to property or the loss of use of any property which may result from or arise out of the possession, condition, use or operation or failure of this product. This limited warranty represents the total liability of Green Bean Battery for any battery. All other warranties implied by state law applicable to the battery shall be limited to the warranty period stated on the sales receipt. Green Bean Battery makes no other warranties, expressed or implied, including the implied warranties of merchantability or fitness for a particular purpose.